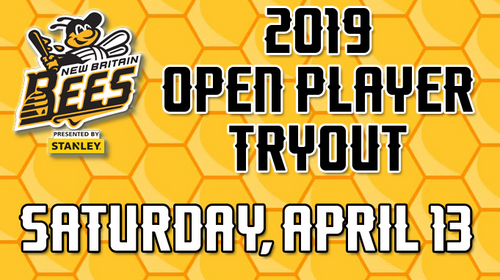 (New Britain, Conn., Jan. 23, 2019) – The New Britain Bees have announced that open tryouts for the team will be held at New Britain Stadium on Saturday, April 13th from 9:00 am to 12:00 pm, with a live on field scrimmage following the tryout. Coaches and representatives from the Bees will be on hand to evaluate the players at the ballpark, including Manager Mauro Gozzo. A group of professional scouts will also be in attendance to evaluate all the prospects.